Today I have the other 3 shades I ordered from American Apparel's newest polish selections, African Violet, Mannequin, and Raccoon. If you'd like to see Army Jacket, I showed that shade yesterday here. 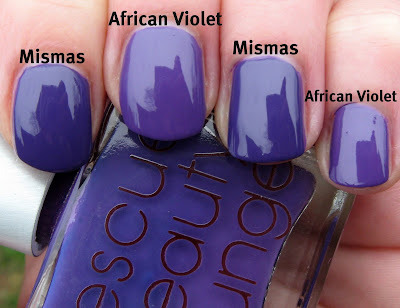 None of these impressed me as much as Army Jacket, but I will say that African Violet is still very impressive in terms of the shade itself and the application. Below: African Violet is a lovely shade of medium purple with a hint of dusty and the slightest touch of plum, all working together to offer a fabulous purple creme shade. I used 2 coats and the formula was near perfect. This one applied much like Army Jacket, but was just the tiniest bit thicker. The first photo was taken with an Ott lamp, while the second photo was taken outside under cloudy skies and I might add, freezing temps...brrrr! Below: My first thought when I saw African Violet was that I wondered how it compared to another purple favorite of mine, Rescue Beauty Lounge Mismas. While they are very close, they are not identical. The first photo, taken with an Ott lamp, shows Mismas on the index and ring fingers, and African Violet on the middle and pinkie fingers. The photo below this one (which I remembered to label!) was taken outdoors under cloudy skies. Below: Swatches on paper give you another look at the differences. 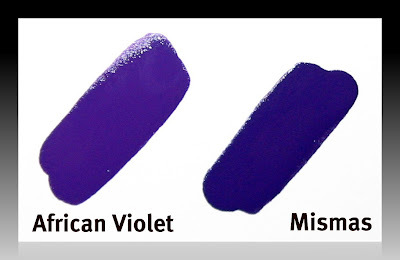 I would say that African Violet leans more purple and is obviously a lighter shade, while Mismas leans a little more blue. Below: Mannequin was thick enough that it wasn't nearly as nice to apply as Army Jacket and African Violet. This Band-Aid shade is shown using 2 coats and I can safely say that I don't think I'll be wearing this one much! I personally don't care for it with my skin tone, but maybe after I add some thinner to it and try it again when I have more of a tan, I'll feel differently. Below: I love a nice chocolate brown shade, which Raccoon is. Again, the formula was thicker than I prefer so I will be adding thinner to this one as well. Another trait I didn't care for is that the gloss finish is quite low on this one. It's certainly not anything a clear top coat won't fix, but I wanted to mention it. 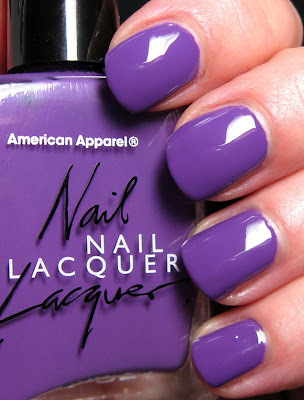 Of the four shades I chose, Army Jacket and African Violet are the clear winners for me. They both had well above average application, the formula was great, and I love the shades themselves. The other two shades I might have liked better had the formula been perfect right out of the bottle, but I'm not that crazy about the colors themselves. Did you order any of the new shades? 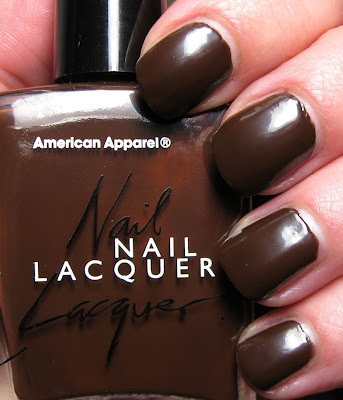 I'm looking forward to seeing more swatches show up, because all in all, I think American Apparel has done a great job with their shades and formulas. They certainly seem to add in some unique shades every time they release new colors. I just need to choose a little wiser sometimes, because I already have quite a few chocolate brown cremes and I don't see this one as being particularly special. 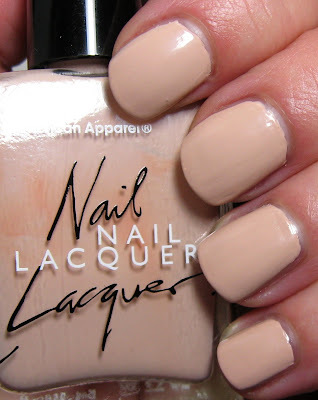 I should know that when it comes to neutral shades like Mannequin, I should stick with something that has a little more taupe in it. Those just seem to work better for me. I like African Violet more. Yeaah, I like these but I am too sad cause Butter and Echo Park went out of stock today before I had a chance to order. Über-bummer :( I'm thnking on Trenchcoat though, I wonder if it really is as mustard yellow as it looks in the bottle pics? 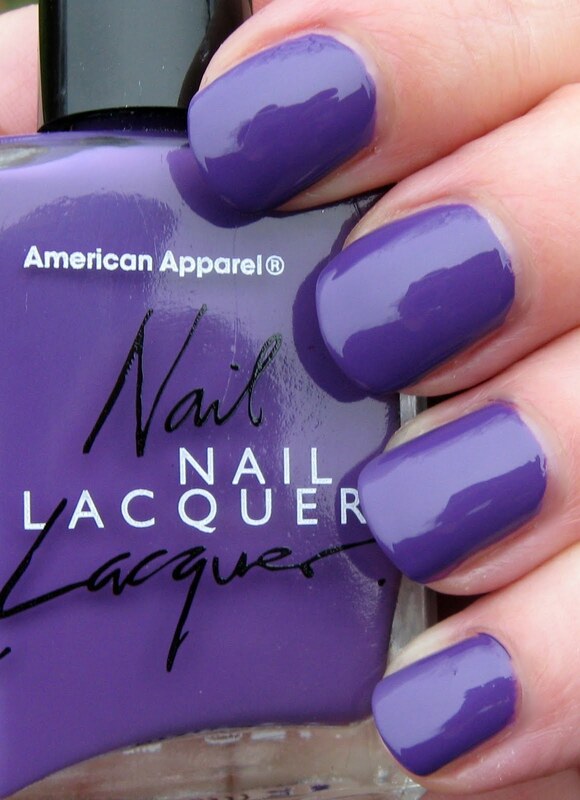 African Violet is a gorgeous shade. That chocolate is really a delicious shade. I'm not to thrilled with Mannequin. One of these days I'll have to order some of these. Do you think there's a dupe to Army Jacket? I love those greens but I do have many of them. I just don't want to keep buying the same shade over and over. Have a blessed Thanksgiving with your family Mary. Enjoy your feast! Everyone have a wonderful Thanksgiving. SO beautiful. Ugh. I have Dynasty on now, I want allll of these. I love Violet and Raccoon! Mannequin is nice as well, but I'm not sure it would work too well with my skin tone. It's kind of odd...I've tried two AA polishes so far, Peacock and Butter, and had completely opposite experiences. Peacock had PERFECT application, like you experienced with Army Jacket, and Butter was thicker and gloopier, like you described Mannequin. Anyway, happy Thanksgiving! I do love Raccoon and even Mannequin, it sort of has to grow on you in liking it, I suppose.